Samurai High Jump is a new Flash release from GamePure with a passing resemblance to Nanaca Crash, but not quite as addictive. 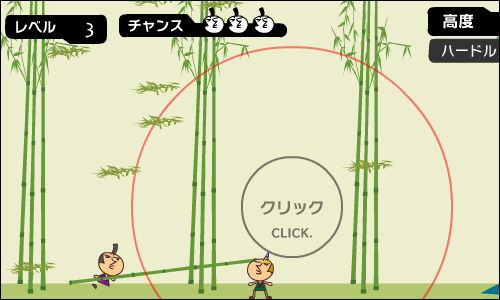 Left click to plant the pole, then repeat the same action to control your ascent. The game doesn't end unless you make three mistakes consecutively, while the height of the bar is incremented progressively for each successful jump.